The Ketchum Farmers Market was drenched with hail and rainstorms Tuesday afternoon, but state agriculture Director Celia Gould said the weather was an appropriate tribute to the producers who make the markets possible. "This is what farmers have to go through all the time," she said. "It's not as rosy as one might think." Gould kicked off the statewide celebration of National Farmers Market Week with a visit to the Ketchum Farmers Market on East Avenue and Fourth Street with a speech on the recent expansion of farmers markets statewide. Since 2006, the number of farmers markets in the state has increased from 24 to 57, which Gould said is driven by consumer demand. "Consumers want fresh, quality products right from the farm," she said. Since 2000, the number of farmers markets nationwide has grown 150 percent, from 2,863 markets to 7,175 in 2011. Kaz Thea, manager of Wood River Farmers Markets, said she's seen an incredible expansion of the markets since she became a manager in 2005. When Thea began, the Ketchum market had about 19 vendors. Now, that number has exploded to 51, peddling everything from baked goods and jam to homemade cheese, T-shirts and sausage. Gould said local farmers markets help promote local economies by keeping dollars in the community and providing small business owners an outlet through which to sell their products. But farmers markets would not be possible without communities concerned about local and sustainable farming, she said. "Those of you here today are clearly supporters of local agriculture," she told the assembled crowd Tuesday. "We want to say thank you." 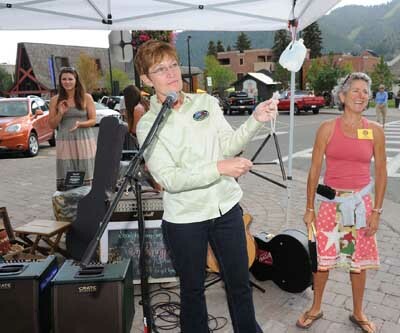 Gould said that though this was not her first time in Ketchum, it was her first time at the Ketchum Farmer's Market. "I love it!" she said, adding that she and her 13-year-old granddaughter were planning on doing some shopping of their own once they were finished handing out free tote bags to market shoppers. National Farmers Market Week began in 1999, as a way to increase awareness of local farmers markets and encourage shoppers to support local growers. Gould said one of the goals of Idaho's participation is to highlight the many benefits farmers markets bring to the local economy. The Ketchum Farmers Market takes place from 2:30 to 6 p.m. every Tuesday on Fourth Street between East and Walnut avenues. Hailey residents can take advantage of the Hailey Market, which takes place from 2:30 to 6:30 p.m. every Thursday on Main Street near Carbonate. Both markets last from June through October.